Bas-relief of Jonah being thrown to the fish. 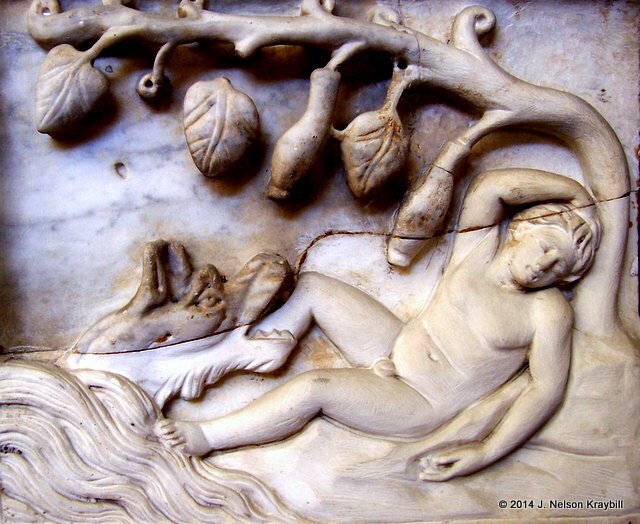 From a fourth-century Christian sarcophagus at Pio Cristiano Museum, Rome. 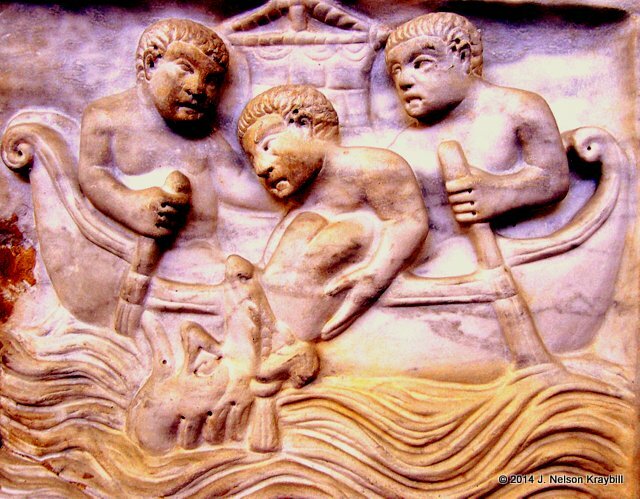 So there is Jonah–and all you can see of him is a bare rear end as three pagan sailors feed him to a big fish! I doubt that the artist at Rome who carved this into a fourth-century Christian sarcophagus thought the image was funny, but it makes me laugh. The fish, though, is a monster of the deep, not the friendly beluga of children’s books. How did it happen that some Christians today read the book of Jonah and argue whether or not a fish could swallow a man and have him live three days in its belly? As if the point of the book is to test whether we can believe five impossible things before breakfast! No, the point of Jonah is that God cares about enemies, even enemies as nasty as the Assyrians! 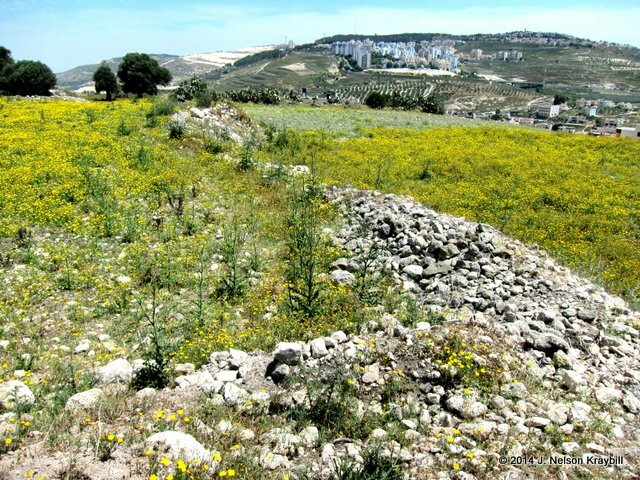 Tel Gath-Hepher, hometown of Jonah, with outskirts of Nazareth in the background. The tel is several acres in size. Gath-Hepher today is a tel, a mound made from the ruins of towns destroyed and rebuilt at the same spot many times over centuries. This tel has not been excavated, so there is not a lot to see. But I was delighted to be at the hometown of a man called by God to speak grace to the enemy. Nineveh (in modern Iraq) was capital of the Assyrian empire, the superpower that destroyed Samaria and the northern kingdom of Israel in 722 BCE. Assyria was notorious across the ancient world for cruelty in war. No wonder Jonah got onto a ship in the opposite direction! Don’t I want to run from enemies personal or national? Or better yet, see their downfall? To be sure, God gave Jonah a message for Nineveh about impending doom (Jon. 3:4). But God’s purpose was to induce repentance and save the city. God was redeeming enemies, not blessing imperialism. There’s that sea monster again–regurgitating the hapless prophet onto dry land, presumably ready to snarf him down again if he turns disobedient. One leg is still in the monster’s mouth! We ignore God’s determination to redeem the enemy at our own peril. This entry was posted in Uncategorized and tagged catacombs, enemies, Gath-Hepher, Jonah, repentance by nelsonkraybill. Bookmark the permalink. So many miss the humor in the Bible! Jesus used it often, and the Bible as a whole is loaded with puns. May we indeed laugh at ourselves and rejoice in God’s grace.